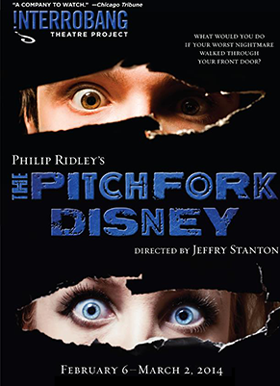 Following its critically-acclaimed, Jeff Award-nominated production of Terminus, Interrobang Theatre Project is pleased to continue its 4th season with Philip Ridley’s dark comedy THE PITCHFORK DISNEY, directed by Co-Artistic Director Jeffry Stanton, playing February 6 – March 2, 2014 at The Athenaeum Theatre, 2936 N. Southport in Chicago, where it is now a resident company. Tickets for THE PITCHFORK DISNEY are on sale through the Athenaeum Theatre Box Office at www.athenaeumtheatre.org or by calling (773) 935-6875. THE PITCHFORK DISNEY features Fred Geyer, Aislinn Kerchaert, Mark Lancaster and Kevin Webb. 23 years after it came kicking and screaming into the world, director Jeffry Stanton takes on this contemporary classic revealing THE PITCHFORK DISNEY has finally come of age. Or perhaps our age has simply come to reflect Ridley’s prophetic nightmare. A spine-chilling pitch black comedy for our anxiety-ridden era! The production team for THE PITCHFORK DISNEY includes: Stephen Carmody (Scenic Designer), Noël Huntzinger* (Costume Designer), Claire Chrzan* (Lighting Designer & Production Manager), Christopher LaPorte* (Sound Designer), Josh Hurley (Props Master), Lindsay Bartlett (Dialect Coach), Julia Rohed* (Stage Manager) and Justin Snyder (Technical Director). *Denotes Interrobang Theatre Project Company Member. Featuring: Fred Geyer (Presley Stray), Aislinn Kerchaert (Haley Stray), Mark Lancaster (Pitchfork Cavaliere) and Kevin Webb (Cosmo Disney). Understudies: Eric Feltes (Cosmo Disney) and Matthew Dealy (Presley Stray). Regular run: Sunday, February 9 - Sunday, March 2, 2014. Curtain Times: Thursdays, Fridays and Saturdays at 8 pm; Sundays at 3 pm. Please note: there will be added 3 pm performances on Saturday, February 15, 22 and March 1; there will be an added 8 pm performance on Wednesday, February 12. Tickets: Previews: $12. Regular run: $20 Fridays and Saturdays evenings, $18 Thursdays, Saturday and Sundays matinees. $12 students and industry tickets (with ID). Tickets are available through the Athenaeum Theatre Box Office at www.athenaeumtheatre.org or by calling (773) 935-6875. Note: all ticket prices include a $2 Athenaeum Theatre restoration fee. Philip Ridley was born in the East End of London where he still lives and works. In addition to three books for adults and the highly acclaimed screenplay for the The Krays feature film (winner of The Evening Standard Best Film of the Year Award), Ridley has written eight adult stage plays: The Pitchfork Disney, the multi-award-winning The Fastest Clock in the Universe, Ghost from a Perfect Place, Vincent River, the highly controversial Mercury Fur, Leaves of Glass, Piranha Heights and, most recently, the hugely successful Tender Napalm (nominated for the London Fringe Best Play Award), plus several plays for young people: Karamazoo, Fairytaleheart, Moonfleece, Sparkleshark and Brokenville. He has also written many books for children, including Scribbleboy (shortlisted for the Carnegie Medal), Kasper in the Glitter (nominated for the Whitbread Prize), Mighty Fizz Chilla (shortlisted for the Blue Peter Book of the Year Award), ZinderZunder, Vinegar Street, Zips’Apollo and the bestseller Krindlekrax (winner of both the Smarties Prize and WH Smith’s Mind-Boggling Books Award), the stage play of which, adapted by Philip himself, was premiered at the Birmingham Rep Theatre in the summer of 2002. He has also directed three feature films from his own screenplays: The Reflecting Skin (winner of eleven international awards, including the prestigious George Sadoul Prize), The Passion of Darkly Noon (winner of the Best Director Prize at the Porto Film Festival) and, most recently, Heartless (winner of The Silver Meliers Award for Best Fantasy Film), starring Jim Sturgess and Noel Clarke. Philip has won both the Evening Standard’s Most Promising Newcomer to British Film and Most Promising Playwright Awards; the only person ever to receive both prizes. He also studied painting at St. Martin’s School of Art and his work has been exhibited widely throughout Europe and Japan. Founded in 2010, Interrobang Theatre Project (Jeffry Stanton and James Yost, Co-Artistic Directors) produces visceral and timely plays that are not readily seen on other Chicago stages. Interrobang upholds live theatre and the act of collective imagining as a powerful means to change our world one play at a time. Interrobang is not recommended for audiences who prefer theatre to be benign or familiar. Interrobang Theatre Project’s third season opened with the “scintillating revival” (Time Out Chicago) of Paula Vogel’s Hot ‘N’ Throbbing. The Chicago Tribune hailed Interrobang “a company to watch,” Time Out Chicago’s 5-star review claimed, “as the production barrels to its shocking finale, it’s clear (Jeffry) Stanton and his impeccable cast are in complete control,” and Newcity Stage exclaimed, “Interrobang Theatre Project, guns ablaze, dives headfirst into the play’s challenging themes, and offers a rare production in which every element onstage is as robust and capable as every other.” Other Interrobang Theatre Project productions include the one-man Here Lies Henry by Daniel MacIvor, the Midwest premiere of The Argument by Gregory Moss, Orange Flower Water by Craig Wright, a co-production with BareBones Theatre and most recently, Mark O’Rowe’s critically acclaimed Irish drama Terminus. An interrobang is the combination of a question mark and an exclamation point, joining the Latin for “question” (interro) with a proofreading term for “exclamation” (bang). Punctuation expresses an attitude, an idea, an attempt to make things clearer. Through the plays we produce, Interrobang Theatre Project poses muscular questions. Navigating through the dark together with our audience we attempt to arrive at new understandings and fresh perspectives of who we are and the world in which we live. For more information on Interrobang Theatre Project, visit www.interrobangtheatreproject.org or www.facebook.com/interrobangtheatreproj.